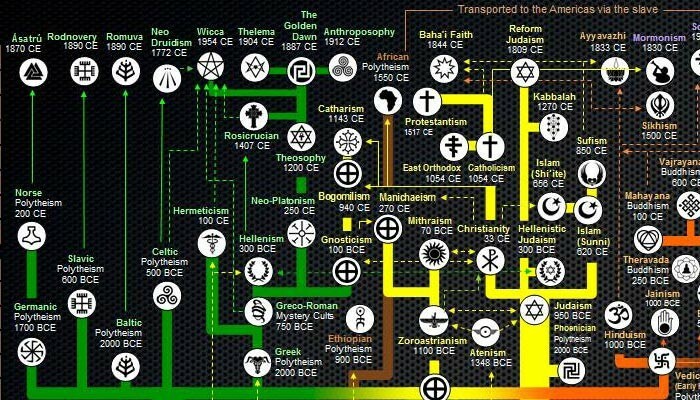 Check out this excellent diagram that maps how world religions have changed and developed, from the beginning of history to now…! Simon E. Davies at the Human Odyssey Facebook group, which posts content on mythology, created this incredible image of the Evolutionary Tree of Myth and Religion, which depicts the development of world religions throughout history, from 100,000 BCE to 2000 CE, and covering several different geographic regions—European, African, Semitic, Iranian, Indian, East Asian, Arctic, North American, South American, New Guinean/Australian and Oceanic. 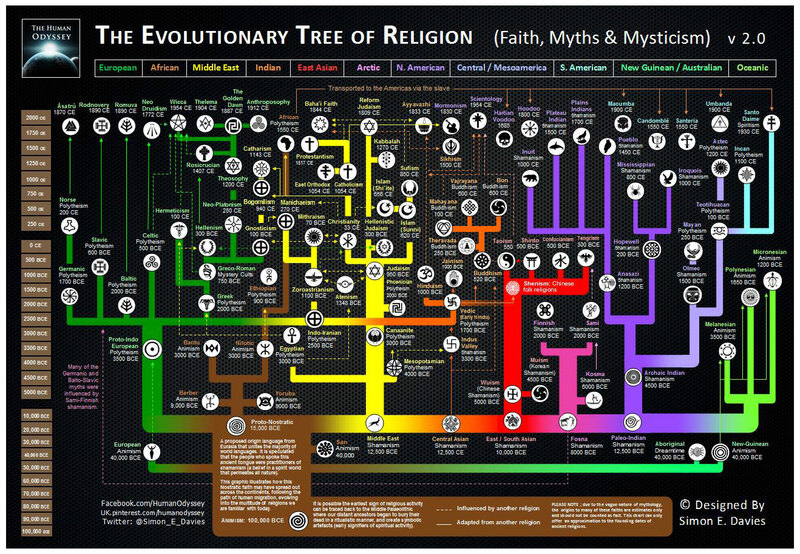 If it all looks a bit like a tech tree from Civilization V, that’s OK—religions develop over time as groups react to their changing environment and circumstances, as well as develop more scientific understanding of the world and their place in it. Religions are ways that large groups of people mythologize and give meaning to their life experience, and maintain a group narrative that can be incredibly powerful, particularly in times of adversity where blind faith can sometimes be the best possible reaction to difficult circumstances. There’s incredible power in this human ability to shape meaning and create stories out of our existence. Stories, mythologies and religions can be the dividing line between death and survival. Stories, myths and religions can provide hope where previously there was no hope, and for that reason they deserve our utmost attention and close study. Understanding religion means understanding human beings, and understanding human beings is the first step towards mastering life. How Do World Religions Change Over Time? Some theorists—particularly the Integral school that stems from Sri Aurobindo, Jean Gebser and Ken Wilber—have posited that world religions (and all human knowledge) advance in an upward spiral of development. While elegant, the theory has the downside of offending everybody whose religion is not at the top of the pile. I’m a huge fan of this image, for several reasons. One, it condenses almost the entirety of human thinking into a single image, rather than a library. Second, it shows how belief systems flow into each other, cross-pollinating with each other and giving birth to new forms as time goes on. It also, perhaps most interestingly of all, shows syncretic neopagan religions developing as the current edge of religion—Asatru, Wicca, Thelema, Anthroposophy, the African disapora religions and several more. Whether one lends credence to or is even familiar with these largely counterculture religious streams, it’s fascinating to think about our current cultural moment—in which such belief forms are largely considered worthless—within the broader context of history. Today’s outsider cult, after all, can easily become tomorrow’s mainstream religion, given the right economic and political pressures. Consider how within the space of only three centuries Christianity—a religion that started as a tiny, persecuted group of cultists that had to meet in mausoleums and were often fed to lions—became the binding force of an empire. Fast-forward through history, and watch Christianity in its various forms become a global empire, with 2.2 billion adherents—one third of the total human beings on Earth. Of course—and this may actually come as a shock to many Americans!—there are world religions beyond just Christianity. Though perhaps not dwarfed in numbers, Christianity only represents a very small range on the broad spectrum of human beliefs. With so many religions in the world, how can we discover who’s telling the truth? Particularly in the 21st century, when people no longer give as much credence to religion, it’s become very hard to respectfully assess and learn from the spiritual heritage of humanity. One incredibly good approach to gaining wisdom from religions, however, is the (perhaps oddly named) discipline of chaos magick, which is not a religion itself, but a framework for approaching religions and extracting all of the good information from them—specifically, just the techniques for changing consciousness, without taking on the dogma. It’s an excellent approach to consolidating humanity’s wisdom, especially when we have more access to information about our own and other cultures than ever before. Check out Ultraculture’s free book and course on chaos magick to find out more about this eminently practical approach to studying religion and making massive life change!